SUMMERFIELD — It’s back to the drawing board for Frances Gallagher and Jay Clapp. The Town of Summerfield signed a $45,000 contract with Gallagher and Raleigh-based WithersRavenel to engineer a concept for an upgrade to the intersection at Summerfield Road and N.C. 150 (Oak Ridge Road). In January, Gallagher and Clapp, a subcontractor with Ramey Kemp & Associates. In January, the pair presented a plan to remove the existing mast arm traffic signal and replace it with a mini-roundabout at an estimated cost of between $250,000 and $300,000. 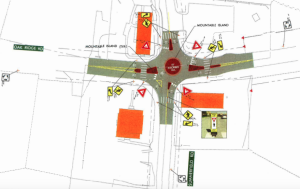 Another presentation by WithersRavenel failed to convince a majority of Summerfield Town Council members that a mini-roundabout was the right approach to any upgrade at the intersection of Summerfield Road and N.C. 150 (Oak Ridge Road). The idea, said Town Manager Scott Whitaker, was to become a key part of a master plan for the intersection that took into consideration the future public use of the historic R.C. Gordon Hardware building and the Martin House for public meetings, for the former and office space and a public museum for the latter. In addition, Gallagher and Clapp said the mini-roundabout would improve pedestrian safety and aid in traffic flow efficiency in relation to concerns about back-ups from U.S. 220. Lastly, the mini-roundabout would be an aesthetic upgrade from the existing mast arm traffic signal, which disrupts the view of the historic buildings from almost any vantage point. Towards the end of a 50-minute discussion during a public meeting of the mayor and Town Council on Tuesday at Summerfield Community Center, Whitaker guided the group to a consensus. At Whitaker’s suggestion, council members directed WithersRavenel to explore other options, including some landscaping (or “streetscape” projects), painting the mast arm traffic signal a less noticeable color and talking with officials from the North Carolina Department of Transportation to see if the traffic signal at U.S. 220 and N.C. 150 could be synchronized with the signal at Summerfield Road and N.C. 150. To date, WithersRavenel has been paid approximately $21,700 of the $45,000 contract. Since the January presentation, it seemed the concept of a mini-roundabout was a foreign one to a majority of the council members. Mayor Gail Dunham and members of the council didn’t seem to believe Gallagher and Clapp that a mini-roundabout would increase pedestrian safety or help the flow of traffic at the intersection, especially motorists coming from U.S. 220. In addition, some scoffed at the idea that large commercial trucks, school buses and ambulances would be able to navigate the mini-roundabout without tearing up the island. Councilman Todd Rotruck predicted the Summerfield area could expect growth of 30 percent over the next decade — another 3,500 people — which he said would change the scenario presented by Gallagher and Clapp. * a 40 percent reduction in pedestrian collisions. Rotruck asked for collision information specific for the intersection. Gallagher and Clapp said they hadn’t yet obtained that information. “Is it really that big of a problem,” Rotruck asked about the general safety at the intersection. Multiple options were discussed as possibilities. Dunham suggested perhaps the existing traffic light be taken down. Gallagher and Clapp said that option, along with replacing it with multiple, smaller signals, was ruled out due to limitations of underground utilities. Councilman John O’Day, who lived in Gettysburg, Pa., and was familiar with that town’s many traffic circles on a major thoroughfare on Pennsylvania Route 16, said he wanted more information and he wanted to get NCDOT’s official buy-in. There, however, was the problem. Clapp said NCDOT wouldn’t officially endorse the project until there was a final design — the image presented to the mayor, the council, the public and within this article was a concept using the existing, paved footprint. O’Day, however, concluded he wanted to proceed with the contract on the mini-roundabout concept. On that, he was alone. Councilwoman Teresa Pegram said the focus on the historic district made her feel that a mini-roundabout wouldn’t fit in very well. Mayor Pro Tem Dena Barnes and Councilman Reece Walker inquired whether a synchronization with the light at U.S. 220 and the one at the intersection could alleviate traffic concerns without anything else added to the project. For Barnes, the roundabout was a no-go. “I think it was a great option to consider, but I don’t think everybody’s jumping on the band wagon,” Barnes said.